To Len, Art is a visual language through which he speaks his dreams. Len speaks the language of Art through color, design, and the effects of light on his subject, communicating feelings of mood, nostalgia, and energy. He portrays in his paintings a positive attitude and the enthusiasm for living the experiences of life with passion and love. One of his goals with his Art is to touch people with the beauty of life and to motivate them to live their dreams. Len is equally at ease with oils, pastel, acrylic, watercolor, gold leaf, and lithography. Many of his original lithographs are being published by major national publishing firms. A new addition to his art is Len’s giclees and his color-enhanced graphics. Much of his sports-related art is available for licensing. 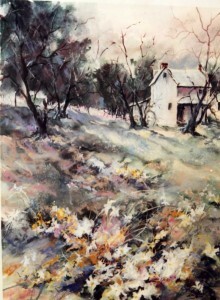 Garon was the Featured Artist in “American Artist” magazine, July 1989, and in “Watercolor 90”, September 1990. Len teaches workshops nationally. He taught “Marketing Art” at the Art Students League in NYC, for the Professional Picture Framers Association (PPFA) for the Art Buyer Caravan Trade Shows with “Decor Magazine”, and for special Art Events sponsored by “American Artist” magazine, Pearl Paint, NAMTA, Amsterdam Art and others. In September, 1999, Garon was selected by the International Football Federation to be their Official Artist. Recently, a publicly traded company sold their “Len Garon Art Collection” for $2 million dollars. In 1974 Len was awarded the “Most Creative Artist” award in a juried competition for his work with 23 karat gold. Since then, he has been listed in “Who’s Who in American Art”, has exhibited in museums, has had acceptance in major national juried competitions in New York City, including the National Academy of Design, has exhibited at the prestigious Hammer Galleries in NYC, been included in many important public, private, and corporate collections throughout the world, and has been the featured Artist in numerous television appearances. * President Clinton was presented the Golf painting “12th at Augusta” by Len Garon. Painting is in the White House, Washington, DC. * Painted 100′ mural of “Little Italy” in Boca Raton, Florida.